Every futures, options, and stock markets trader operates under a set of highly suspect rules and assumptions. Are you risking your career on yours? 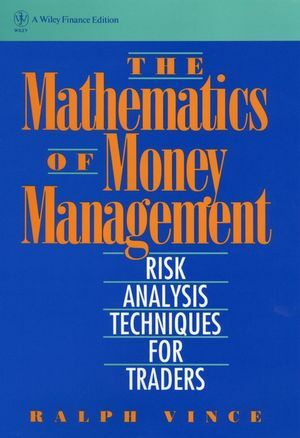 Exceptionally clear and easy to use, The Mathematics of Money Management substitutes precise mathematical modeling for the subjective decision-making processes many traders and serious investors depend on. Step-by-step, it unveils powerful strategies for creating and using key money management formulas--based on the rules of probability and modern portfolio theory--that maximizes the potential gains for the level of risk you are assuming. With them, you'll determine the payoffs and consequences of any potential trading decision and obtain the highest potential growth for your specified level of risk. You'll quickly decide: What markets to trade in and at what quantities When to add or subtract funds from an account How to reinvest trading profits for maximum yield The Mathematics of Money Management provides the missing element in modern portfolio theory that weds optimal f to the optimal portfolio. About the author RALPH VINCE is a computer trading systems consultant who develops computerized futures, options, and stock markets trading strategies for traders, advisors, and software vendors. He is the author of the widely hailed Portfolio Management Formulas: Mathematical Trading Methods for the Futures, Options, and Stock Markets (Wiley). Characteristics of Fixed Fractional Trading and SalutaryTechniques. Parametric Optimal f on the Normal Distribution. Parametric Techniques on Other Distributions. Introduction to Multiple Simultaneous Positions Under theParametric Approach. Correlative Relationships and the Derivation of the EfficientFrontier.